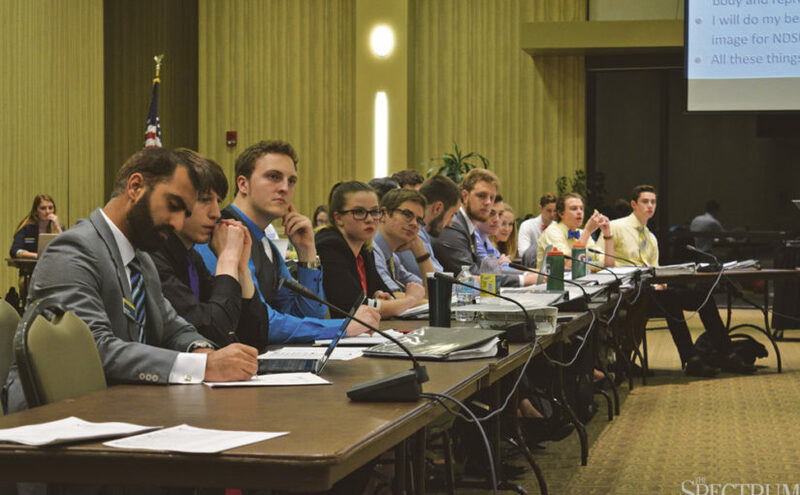 After heated deliberation Sunday night, North Dakota State’s student government passed its annual budget for the 2018 fiscal year with a vote of 25-3, with three senate members absent from the meeting. Calla Harper, a student senator representing the residence halls, moved to suspend existing senate bylaws that restrict the reallocation of any tier I organization’s budget by a maximum of 2.5 percent. She made the motion before deliberating on which organizations would face potential funding reallocation. The motion, needing a two-third’s majority to pass, failed in a 15-13 vote. Harper said hindsight has “definitely been 20/20” with the implementation of the cap earlier this school year. She said the cap does not have very much wiggle room to fix other organizations. Executive Commissioner of Finance Mason Wenzel said the legislation passed pertaining the cap was to prevent uncoordinated attacks against organizations’ budgets. “(The bill) passed to stop mayhem from happening, essentially,” he said. “We haven’t heard what we want to change but we already move to suspend the rules,” Wenzel said, saying the situation was a problem. Janna Stoskopf, assistant vice president and dean of student life, said the purpose of the cap implementation was due to tier I organizations having payroll positions, in which any drastic cuts to them could affect peoples’ livelihoods. NDSU’s student run radio station KNDS 96.3 FM was the only organization discussed to have its funds potentially reallocated to another organization. Benjamin Mach, a student senator representing the College of Engineering, said a recent student government survey indicated approximately three of every four NDSU students “had no clue” what KDNS is. He then moved to amend the current budget proposal to drop KNDS by a full 2.5 percent. A full drop in the cap would amount to $824, Emily Marshall, a student senator representing the residence halls, said. Summer Zito, a student senator representing off campus students, asked if the cut would make or break KNDS. McKinley Theobald, KNDS’ music director and representative to the meeting, said,”Frankly I don’t know where that money is coming from,” adding it would likely come from KNDS’ block party or technology upgrades. Theobald was the only officer able to attend the evening meeting. Bill Law, a member of performing arts who sits on the Finance Advisory Board, addressed the potential cut to say the Finance Advisory Board has recently placed KNDS on probation, in which the student organization was given a set of goals to improve upon over the next year. Theobald said goals include doing more live broadcasts from campus events, doing one remote broadcast per week and being on top of sports reporting. Briana Heskin, a student senator representing the College of Business, said cutting KNDS while on probation would set the organization up for failure. “I just don’t see decreasing them by $900 to be effective,” she said. Brendan Curran, vice chair of the student senate, said he was disappointed in student senators for not taking initiative to find out what they missed at a budgeting meeting with KNDS and disappointed in KNDS for not sending a member with more experience in the organization. The general manager and news director at KNDS presented its budget the Sunday prior to budgeting. They received few questions from student senators, some of whom were late. “If you weren’t here to know what goes on, that’s your fault,” Curran said. Curran also said the finance advisory board approved KNDS’ budget, so it should stay as is in student senate. Stoskopf said around 15 years ago when the tier system was originally implemented, she was asked by former NDSU President Joseph Chapman to make the system work, adding the tier system was set up so there was solidity and consistency from year to year. “I do not want to be in the president’s office again and having him say, ‘This system doesn’t work’,” Stoskopf said. KNDS projects it will use $400 on t-shirts for marketing and fundraising in the coming year, though Theobald said the revenue raised from t-shirts is low. KNDS projects to spend $9,960 on rent, telephone and internet usage over the next year. This is due to the organization being housed in the High Plains Reader building, located across the street from Barry Hall in downtown Fargo. Theobald said KNDS aims to get back on campus as soon as possible so as to increase its presence and relieve these costs. Theobald said the group has been off campus at the HPR location for 3 years, with which comes struggles including difficulty getting interviews, transporting gear to events and that KNDS at its old location used to be a community place to hang out. KNDS’ budget projection for the 2017-18 fiscal year estimates total funds of $36,105 dollars from the student activity fee. That projection is broken down further into paying $14,860 in nine employees’ stipends, $11,695 in licenses and facility costs, $6,100 in funding its annual block party, $750 for sports traveling and summit line fees and $2,200 in variable costs ranging from equipment upgrades to food for the station and initiation meetings. Tier I organizations asking for an increase were asked by Curran to present why they needed an increase. Kim Bruemmer from Campus Attractions said the increase in funding would increase salary pay for employees and to provide larger opportunities for events on campus. Mathew Warsocki, student government’s executive commissioner of the congress of student organizations who over sees tier II and tier III organizations, said an increase of funding would account for budget shortfalls over the previous years. Bill Law, representing performing arts, shared similar remarks. He said his organization aimed to get back to the level of funding it had a few years ago. Ethan Green from Campus Recreation and Intramurals said an increase in funding would go toward increasing staffing and equipment, and Pat Fredrickson from NDSU Athletics said any funding increase will go toward helping teams travel. Steve Winfrey, director of the Memorial Union, said MU will be needing an increase to accommodate for hiring new staff, carpet and wall repairs in the Great Plains Ballroom and vacuum repairs. Winfrey added MU receives no money from the University for funding, though through leases it does raise money from the school. He said MU has considered charging staff and faculty for room usage, though it couldn’t due to the poor funding of NDSU. Spencer Moir, student body president, said after the budget was approved that it is not impossible to cut funding. “If you have a really good reason to do it, you can totally do it, but what we saw here tonight was when one senator or two senators have this idea in their head that they haven’t really discussed with other people,” Moir said. He said this year was an improvement from last year, with the new cap on funding reallocation helping the situation. “It all comes down to communication,” Moir said. “The main point of contention at this meeting was, like, ‘No one knows about KNDS, so let’s cut their funding’,” adding that similar discussions were held at FAB meetings. Ultimately, Moir said the funds were allocated the best they could be.